Fear is a powerful motivator …and inhibitor. But one person’s nightmare is another’s thrill ride. I’m not a fan of rats. But, I have friends who have pet rats. How do our fears—and their more extreme counterparts, phobias—define us and the characters we write about? How do we make some fears universal—or at least show how deeply a character feels a fear? For me, the artistry is in conveying a character’s fear while reminding the reader of his or her own vulnerability. Even most knife enthusiasts don’t won’t to get stabbed by one (Aichmophobia). A character’s fears also reveal much about the character, from background (what caused the fear) to traits (a fear of aging could reveal vanity). 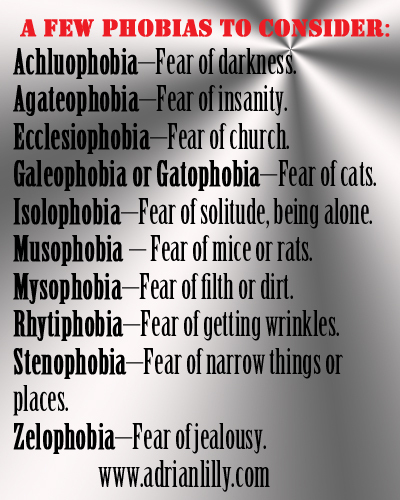 It’s important to remember that some fears can be over quite mundane, everyday items, like mysophobia above. And it’s also important to remember that fear is relative and situational. By relative, I mean that one character may have a minor fear of the dark and another a debilitating fear of the dark. By situational, I mean that a character may not be afraid to walk across a dark room in his own home but terrified of a dark hall in a hospital. Ultimately, our fears are a large part of who we are, even our small fears: they inform us, guide us, shape our decisions. Used properly, our character’s fears can reveal a rich depth we may have missed without exploring what scares him or her.